For historical reasons, NCL contains a suite of EOF functions. The recommended functions are: eofunc_n_Wrap, eofunc_ts_n_Wrap and eofunc_north. If no meta data is desired: eofunc_n and eofunc_ts_n. See the eof_n_640.ncl scripts below for examples of using the new xxxx_n functions. Standard EOF (aka eigenvector, principal component) analysis yields patterns and time series which are both orthogonal. The derived patterns are a function of the domain and the time period being used. The EOF represntation is optimal in the sense that maximum variance may be accounted for by choosing in order the eigenvectors associated with the largest eigenvalues of the covariance matrix (Kutzback, 1967). However, the EOF procedure is strictly mathematical and is not based upon physics. The results may produce patterns that are similar to physical modes within the the system. However, physical meaning is dependent on your interpretation of the mathematical result. To be clear, EOF analysis is not a statistical procedure. However, because the results are orthoganal (ie, independent), they have been used as predictor variables in some statistical applications. EOFs are eigenvectors of the covariance matrix formed from the input data. Since an eigenvector can be multiplied by any scalar and still remain an eigenvector, the sign is arbitrary. In a mathematical sense the sign of an eigenvector is rather unimportant. 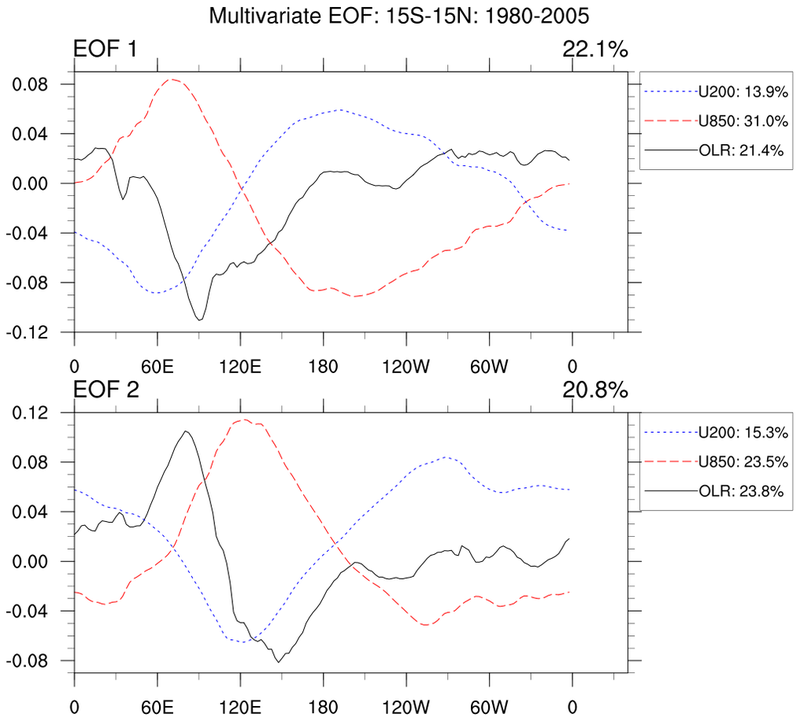 This is why the EOF analysis may yield different signed EOFs for slightly different inputs. Sign only becomes an issue when you wish to interpret the physical meaning (if any) of an eigenvector. 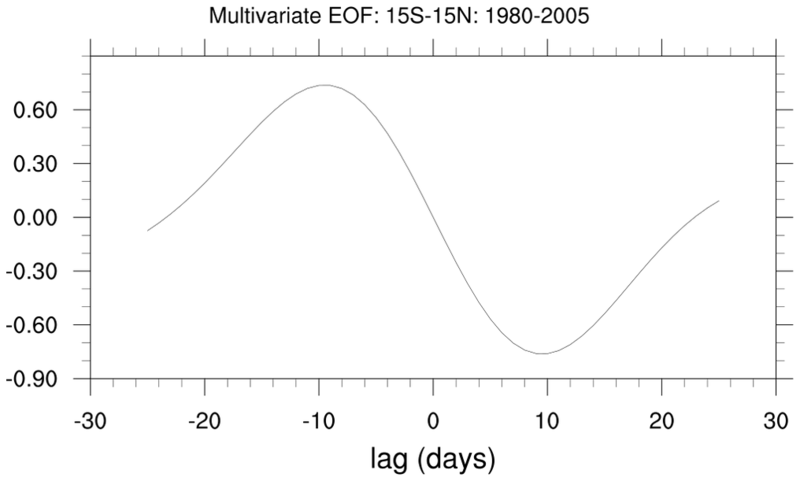 You should approach the interpretation of EOFs by looking at both the EOF pattern and the associated time series together. 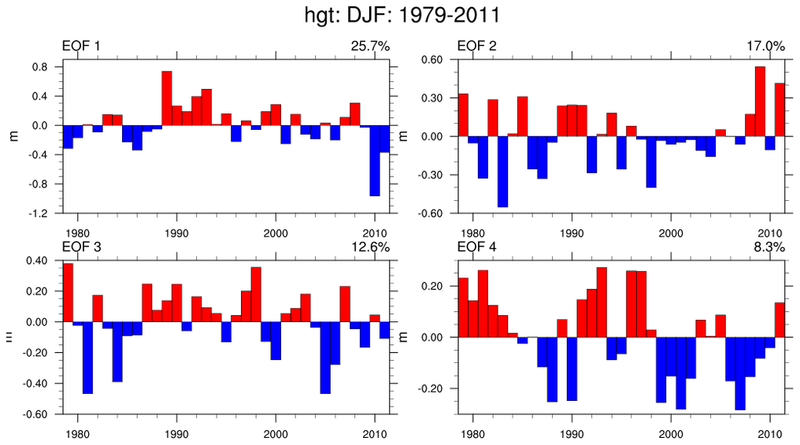 For example, consider an EOF of sea surface temperature. 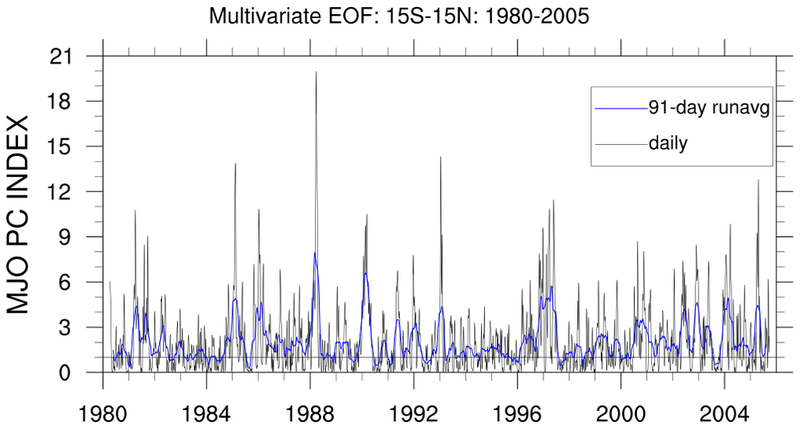 If your EOF has a positive centre and the associated time series is increasing, then you will interpret this centre as a warming signal. If your EOF had come out the other sign (ie. 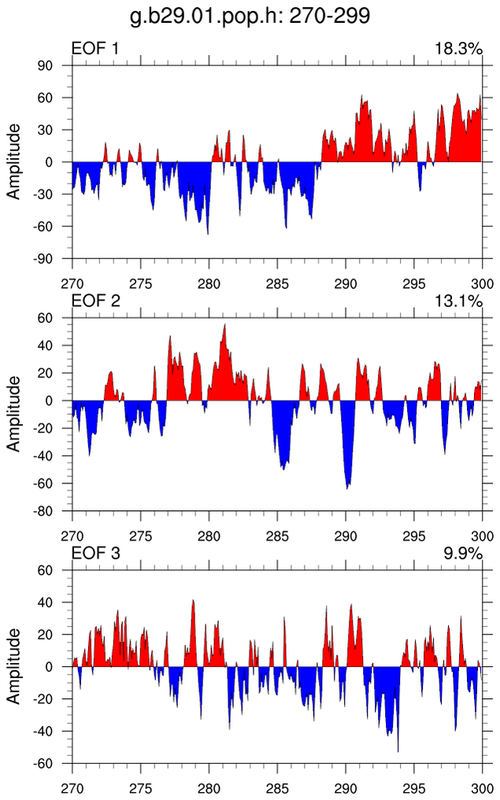 a negative centre), then the associated time series would also be the opposite sign and you would still interpret the centre as a warming signal. 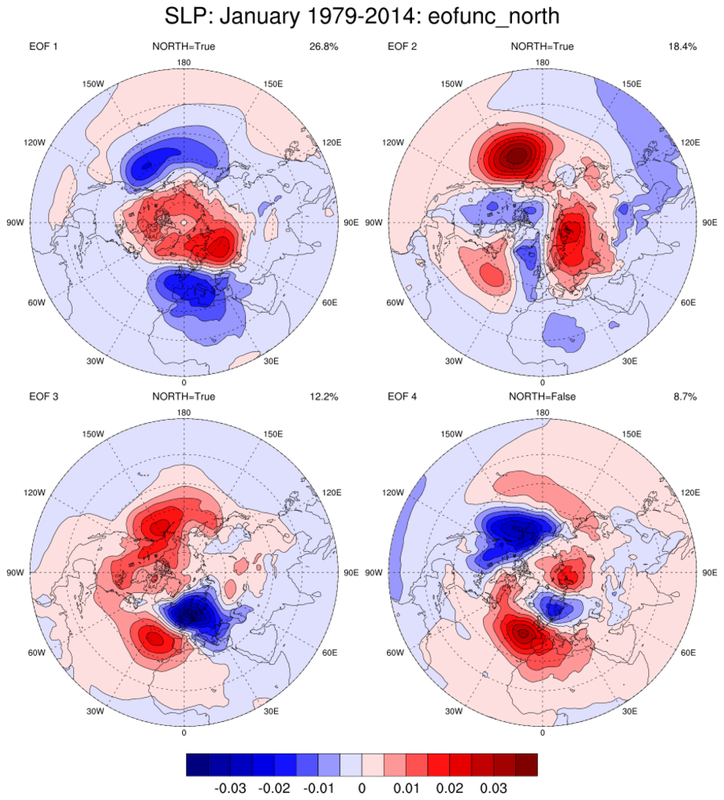 EEOF provides the ability to discern 'common patterns of variability' shared among multiple datasets in both space and time. The "extension" may be in space (S-mode) or in time (T-mode). A visual depiction of these modes is Figure 1 of the Neeti and Eastman (2014) reference. A disadvantage of EEOF "is the possibility that little coherrent persistence exists in the data field so that the functions may obfuscate the spatial coherence identified by traditional technique" (Weare, 1982). Dietmar, D. and Latif, M.
J. 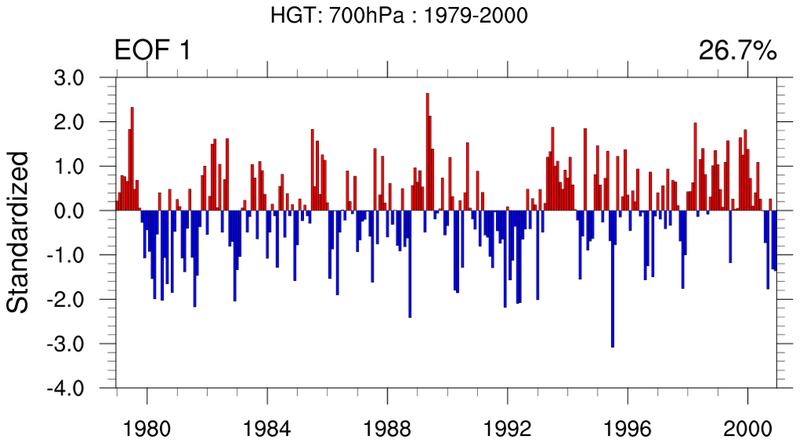 Climate, 2002:  15: 216-225. Mon. Wea. Rev., 1982: 110, 699-706. Mon. Wea. Rev., 1986: 114, 1603-1610. Quart. J. Roy. Meteor. Soc., 1977: 103, 467-478. The results match the book exactly. The eof_0.ncl and eof_0_640.ncl scripts produce identical results; eof_0_640.ncl uses functions eofunc_n and eofunc_ts_n (added in NCL V6.4.0) to avoid having to reorder the data. The source data is available here. The output from running the above script is here. 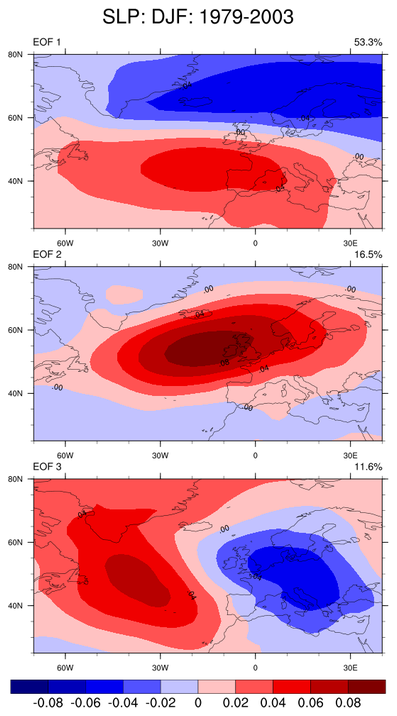 eof_0a.ncl: Same as Eof_0 but here the data are weighted (cosine of latitude). The script illustrates how to 'unweight' the data. 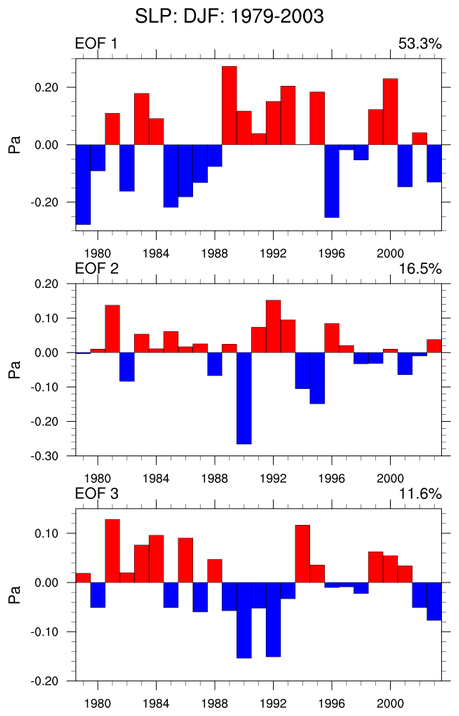 eof_1.ncl / eof_1_640.ncl: Read sea level pressure; extract the data spanning 1979-2003; calculate the first three EOFs over the North Atlantic region for the winter (DJF) season. 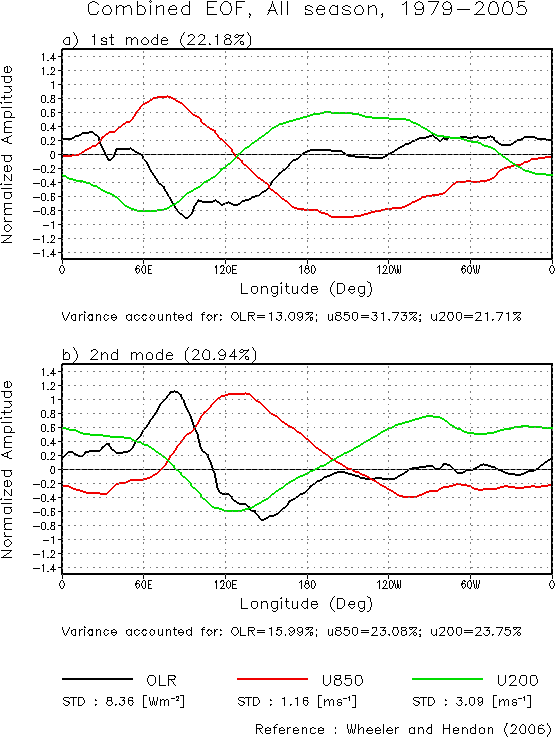 The first EOF pattern is commonly identified as the North Atlantic Oscillation (NAO) mode. lonFlip is used to rearrange the data to span -180 to 180. Then coordinate subscripting is used to extract the region of interest. 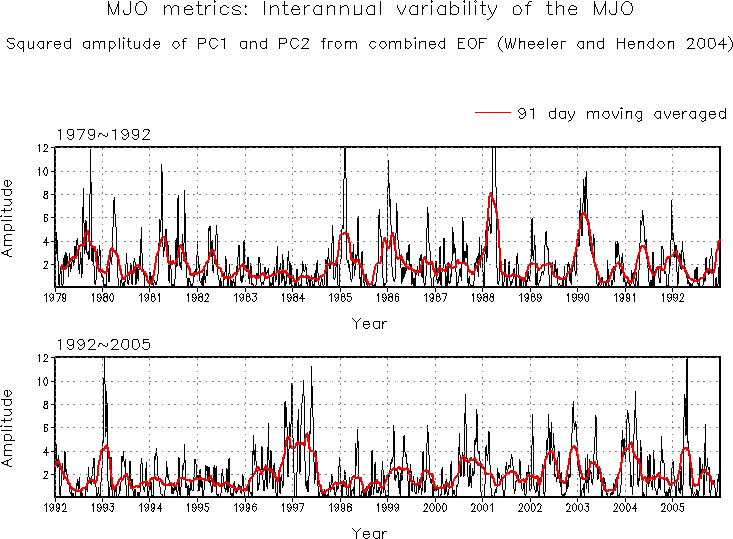 Finally, the resulting principal component time series is normalized by the weights used to get the time series of the mean areal amplitudes. eof_2.ncl eof_2_640.ncl: This is an example posted by David Pierce (Scripps). NCL uses code posted at the the Scripps site. 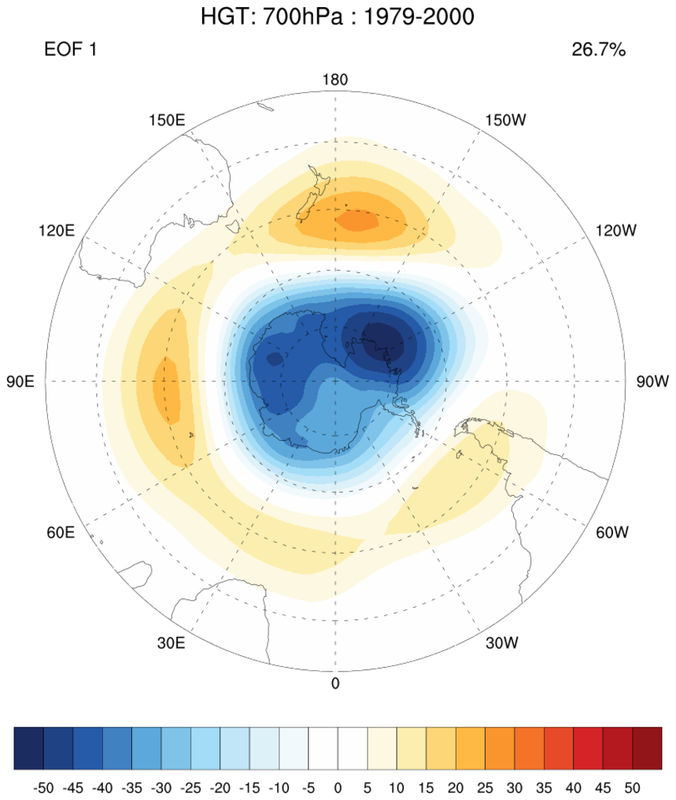 The Scripps example only shows the results from the first EOF. This example shows three patterns and time series. This example was created to illustrate that NCL's eofunc / eofunc_n and eofunc_ts / eofunc_ts_n results match Pierce's. Note that no areal weighting was performed. eof_3.ncl / eof_3_640.ncl: From a directory with many POP files, (1) read 30 years spanning years 270-279; (2) compute climatology; (3) compute anomalies; (4) mask out all regions but the Atlantic basin; (5) weight grid by area; (5) compute EOFs; and, (7) plot. 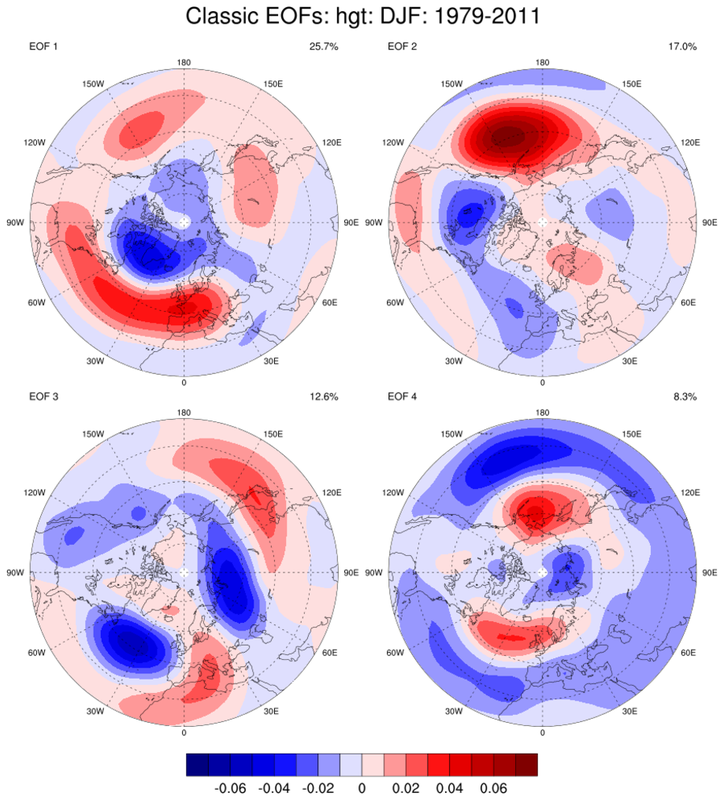 eof_4.ncl / eof_4_640.ncl: Use the approach outlined at the Climate Prediction Center to compute the Antarctic Oscillation (AAO) for the period 1979-2000: Read geopotential height data (source: Reanalysis-2); select 700hPa and data poleward of 20S; compute monthly climatologies and anomalies; weight observations; compute EOFs; normalize the principal components; and project the anomalies via regression. 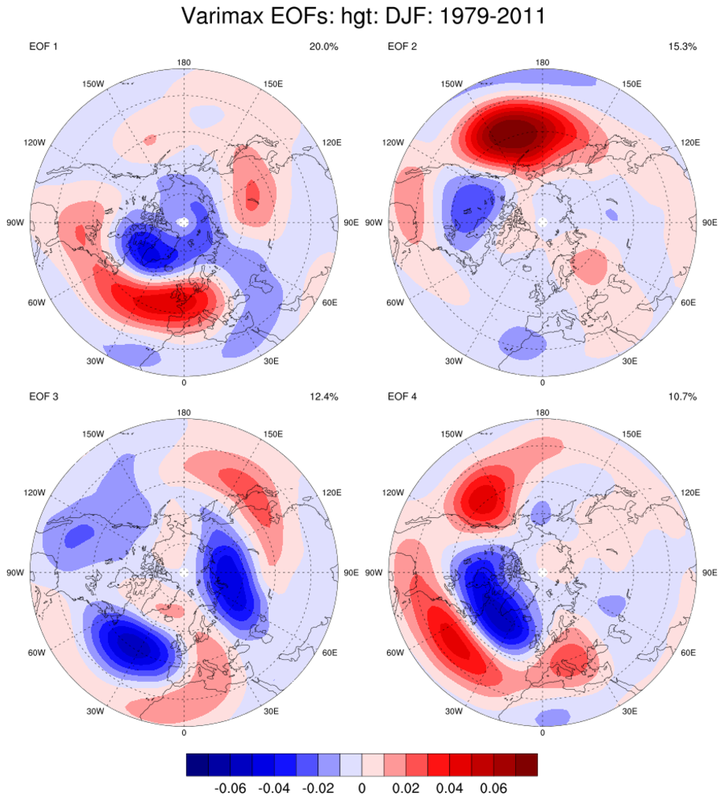 eof_5.ncl / eof_5_640.ncl: Compute EOFs for the northern hemisphere height field at 500hPa. Use cd_calendar to create an array containing time in the form of YYYYMM. Then use ind to determine the index values corresponding data from 1979-2011. Read the desired data using NCL's coordinate subscripting. 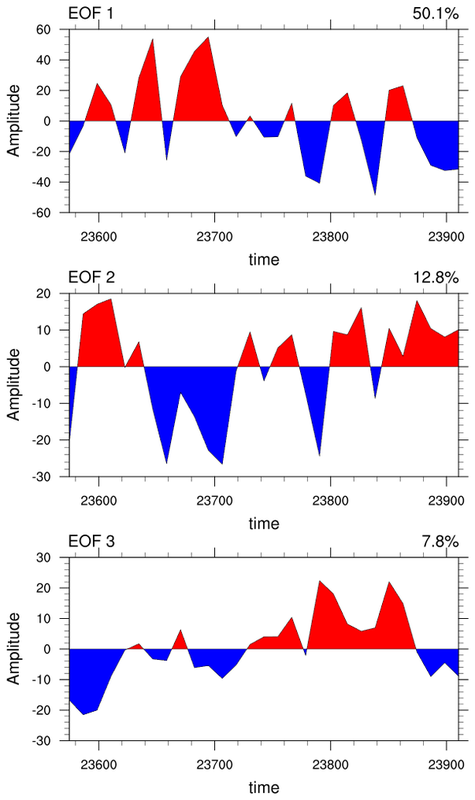 Compute standard EOFs via eofunc_Wrap and the corresponding time series via eofunc_ts_Wrap. Because we want to do a varimax rotation 6 EOFs were computed. This (neof=6) is arbitrary but it should be large enough to allow eofunc_varimax_Wrap to reorthogonalize the subset. Finally, eofunc_varimax_reorder is used to place the output into descending order. The attribute pcvar_varimax represents the variance explained after the varimax rotation has been applied. 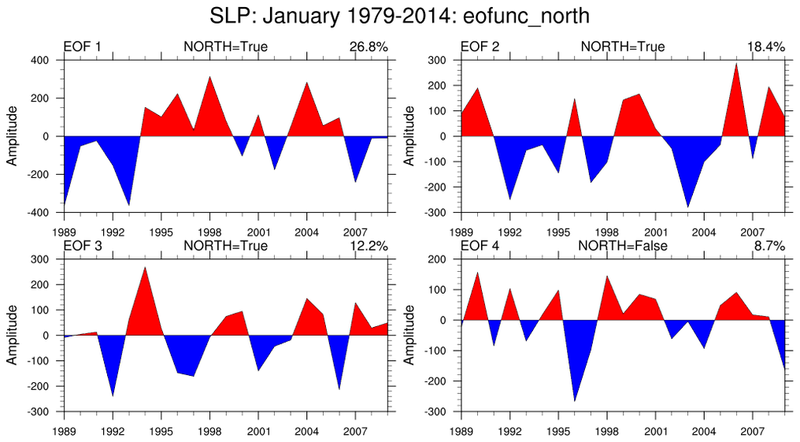 eof_6.ncl / eof_6_640.ncl: Compute EOFs for the northern hemisphere January sea level pressures from 1989-2009. The eofunc_north is used to assess if eigenvalues are distinct. if the prinfo argument is set to True. The following will be printed. where 'dlam' is the 'shift' (North's term). Shikha Singh (Scientist, Indian Institute of Tropical Meteorology, Pune, India) has suggested multiple methods for combining different variables with common dimensionality: (time,lat,lon). Dr. Singh also suggested the following for S-mode EEOF using longitude and latitude spatial extensions. 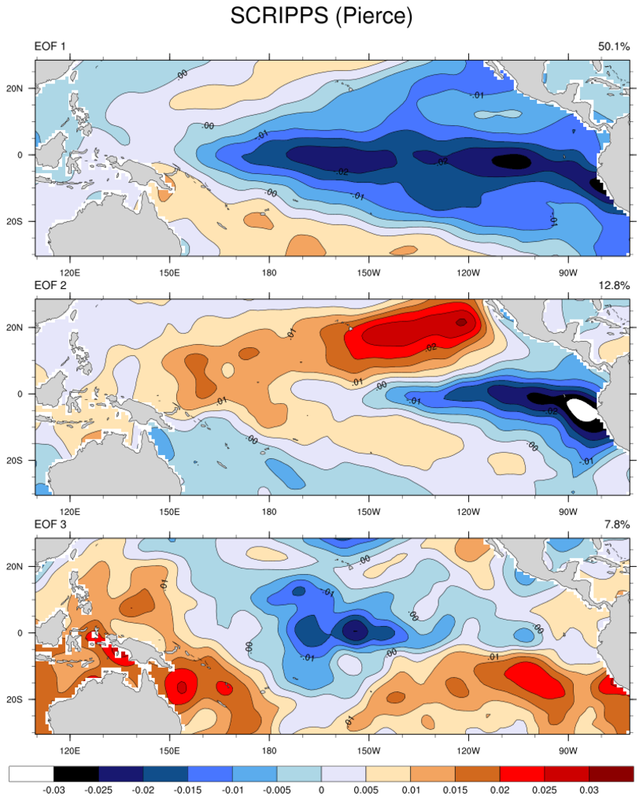 The data from OLR, Uwind, Vwind are averaged along latitude to make 2D data. The 3 variables are then combined into a bigger matrix: (time,space). 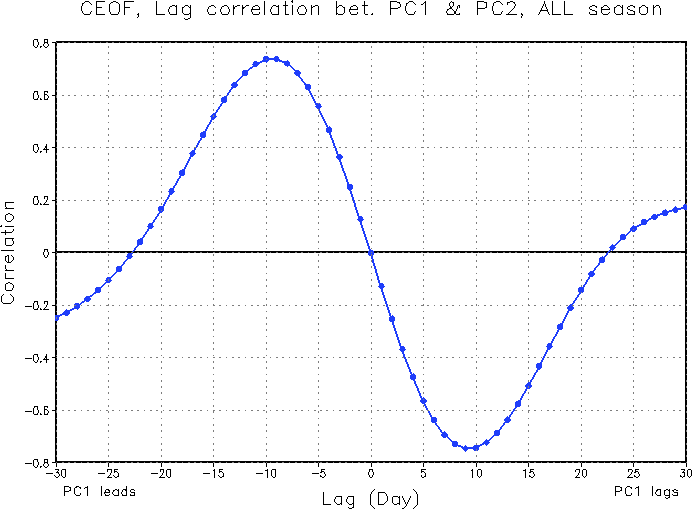 Multivariate (Combined) EOF; cross-correlations between EOF1 and EOF2; time-series of (PC1^2 + PC2^2) and 91-day running mean. This script was updated 2 March 2015. Marcus N. Morgan (Florida Institute of Technology) submitted the code segment that calculates the percent variance for each component in the multivariate EOF.